This is the 1998 "World Cruise"/Operation Southern Watch cruise patch for the VFA-131 "Wildcats" onboard the USS John C. Stennis (CVN-74) as a part of CVW-9. 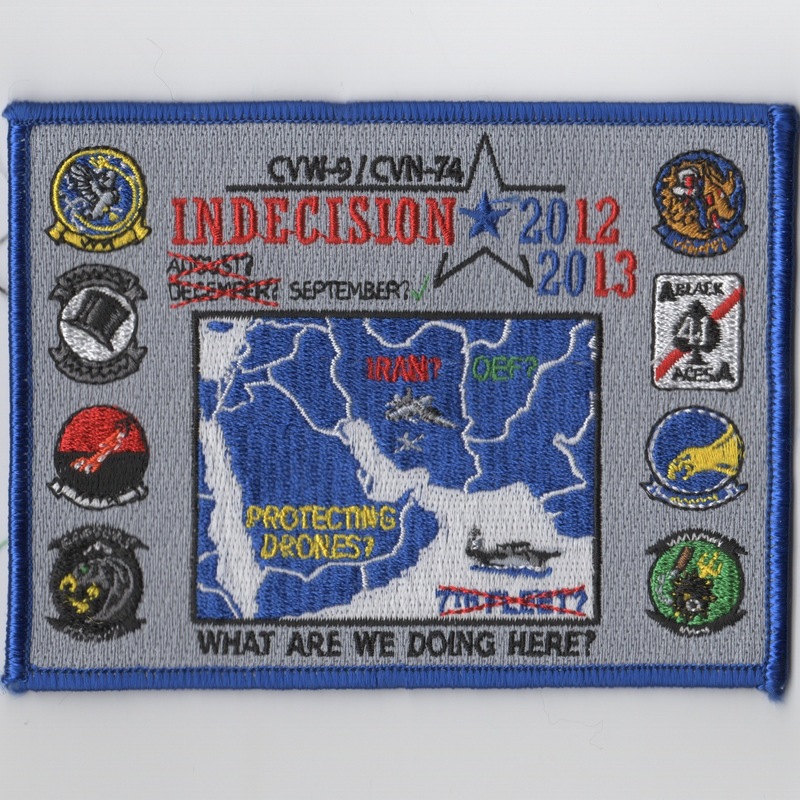 This is the Operation Enduring Freedom (OEF) cruise patch the USS John C. Stennis (CVN-74) as a part of CVW-9. 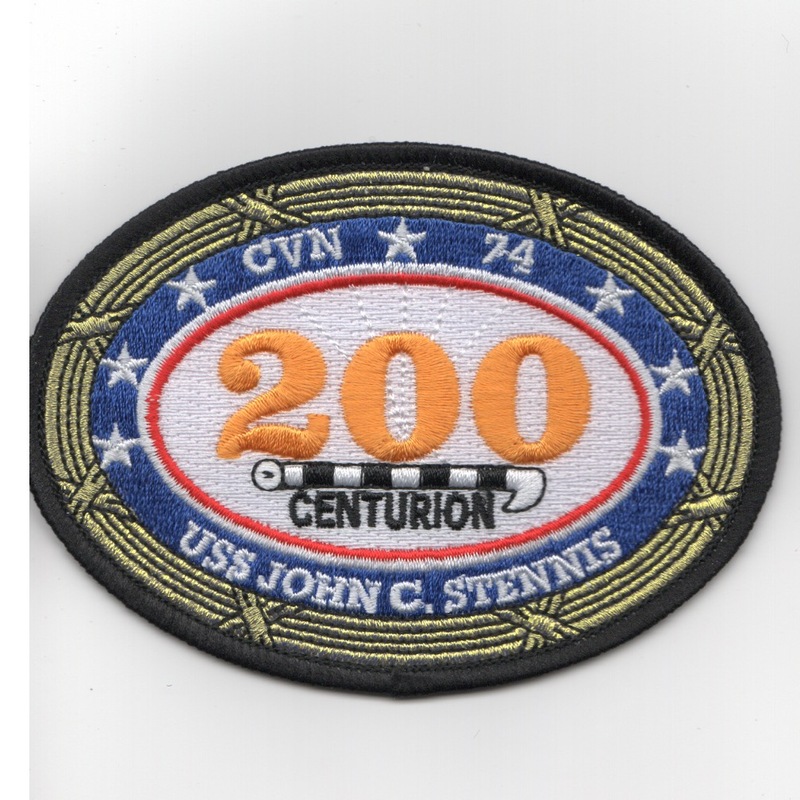 This is the cruise patch for Operation Enduring Freedom for VF-211 onboard the USS John C. Stennis (CVN-74) as a part of CVW-9. This is the pentagon-shaped commemorative "theater-made" cruise patch for Operation Enduring Freedom for VF-211 onboard the USS John C. Stennis (CVN-74) as a part of CVW-9. This is the 2004 WestPac Cruise patch for CVN-74/CVW-14 and all the squadrons in the airwing. It was created specifically for VAQ-139, VF-31, VFA-113, VFA-25, and VFA-115. It show the "fat guy" with the DMB tattoo on his left arm. 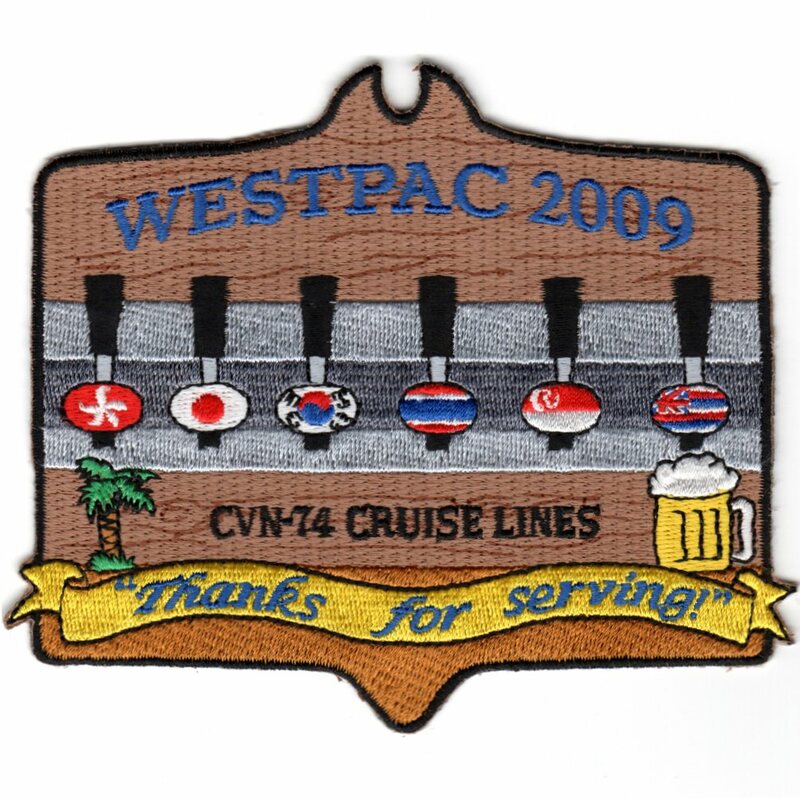 This is the 2004 WestPac Cruise patch for CVN-74/CVW-14's Intelligence branch in the Strike Group. It shows the Russian "Hammer & Sickle" on the chick's leg. 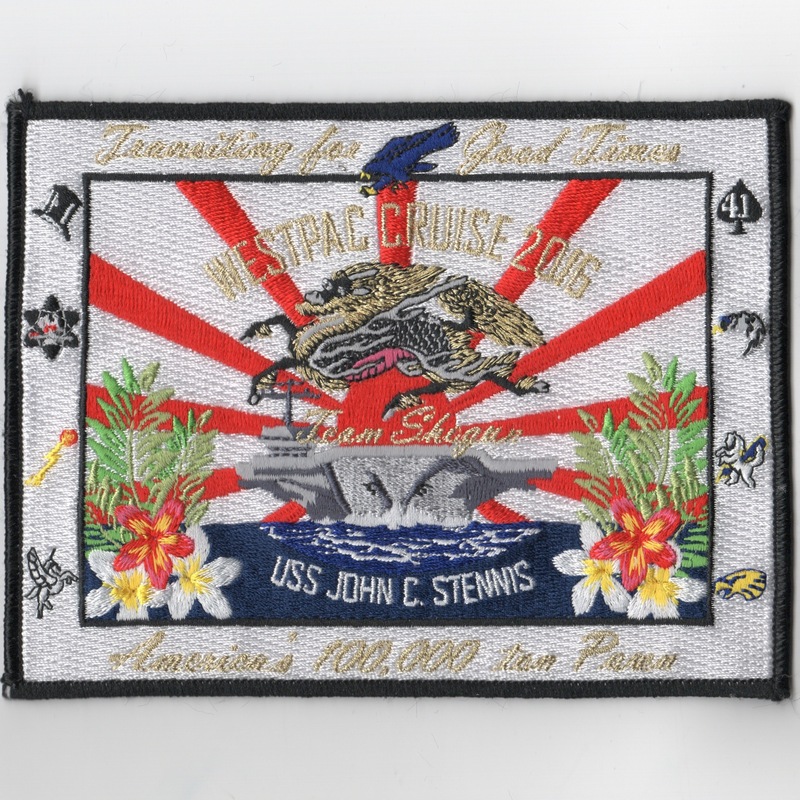 This is one of the cruise patches we bought from the squadron that was created for CVN-74 and their Airwing for the 2009 WESTPAC Deployment. It says "CVN-74 CRUISE LINES - THANKS FOR SERVING". It shows a bar with beer taps that have all the flags of the countries they visited. This patch does not come with velcro attached. 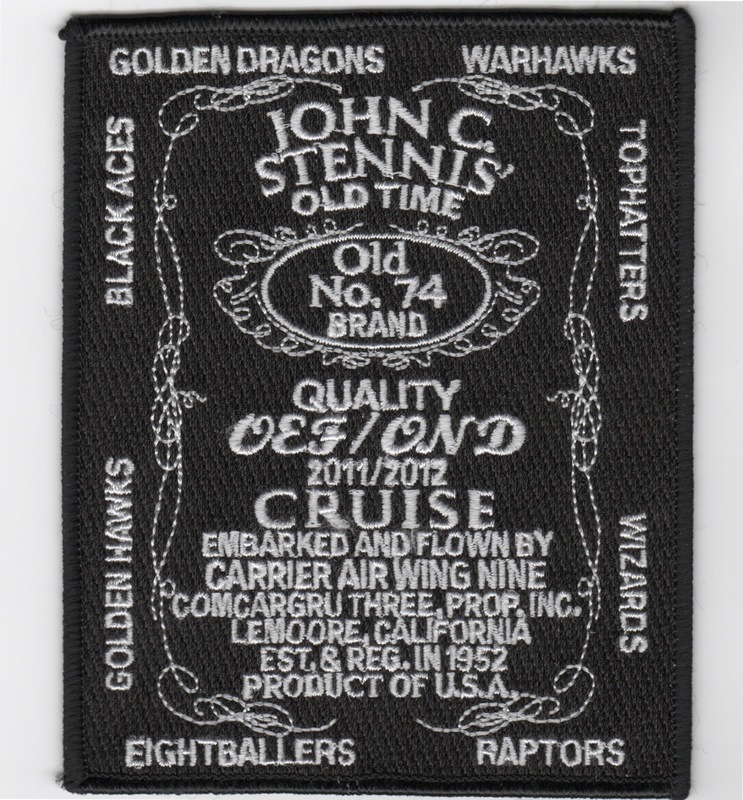 This is one of the 2011-2012 cruise patches for the USS John C. Stennis (CVN-74) and Airwing 9 for their 2012 OEF/OND (Op New Dawn - Libya) Med cruise. It's says "Embarked and flown by Carrier Air Wing Nine, COMCARGRU THREE" with all the squadrons listed along the sides. 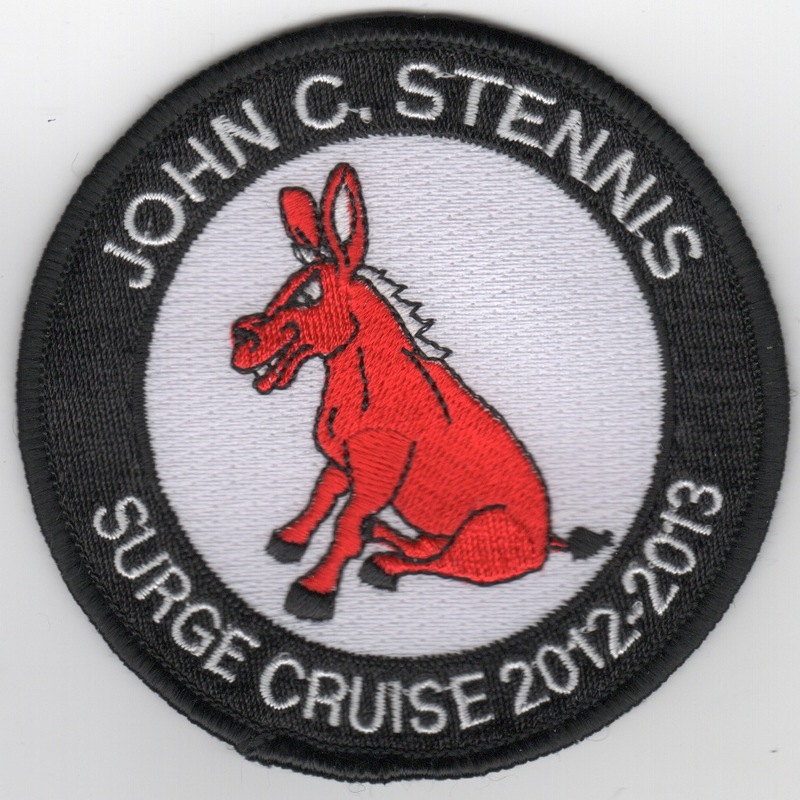 This is one of the 2012-2013 cruise patches for the USS John C. Stennis (CVN-74) for their 2013 Med cruise. 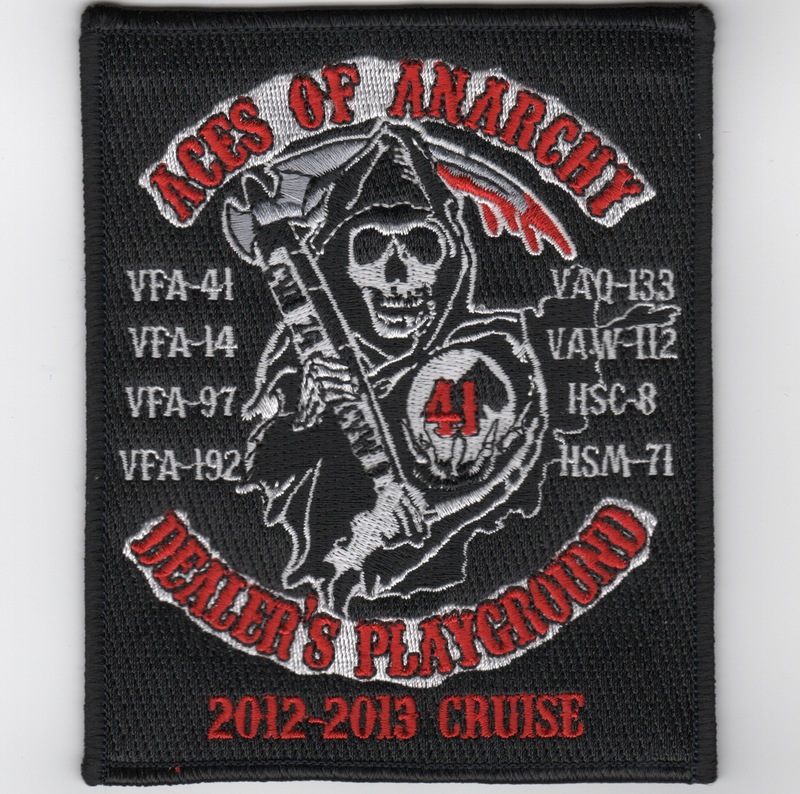 It's says "ACES OF ANARCHY" across the top and "DEALER'S PLAYGROUND" across the bottom with all the squadrons listed. 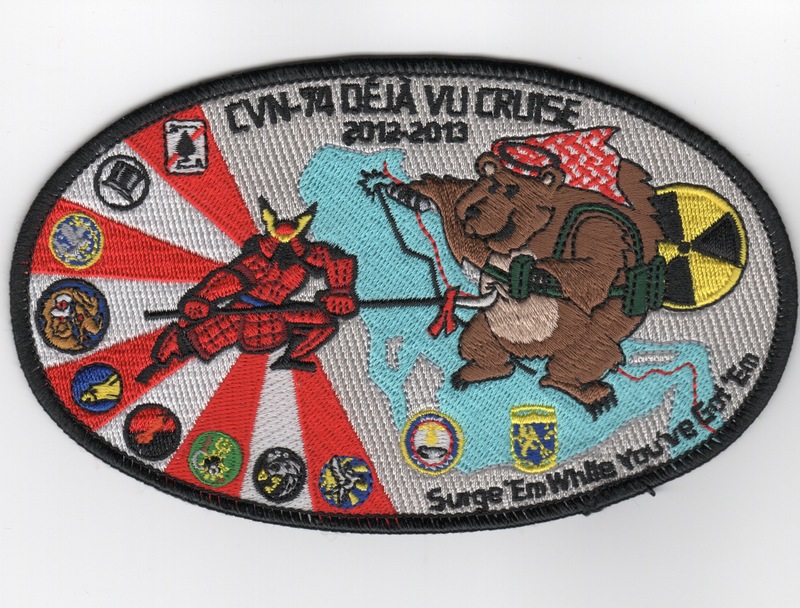 This is one of the 2012-2013 cruise patches for the USS John C. Stennis (CVN-74) for their 2013 Med cruise. 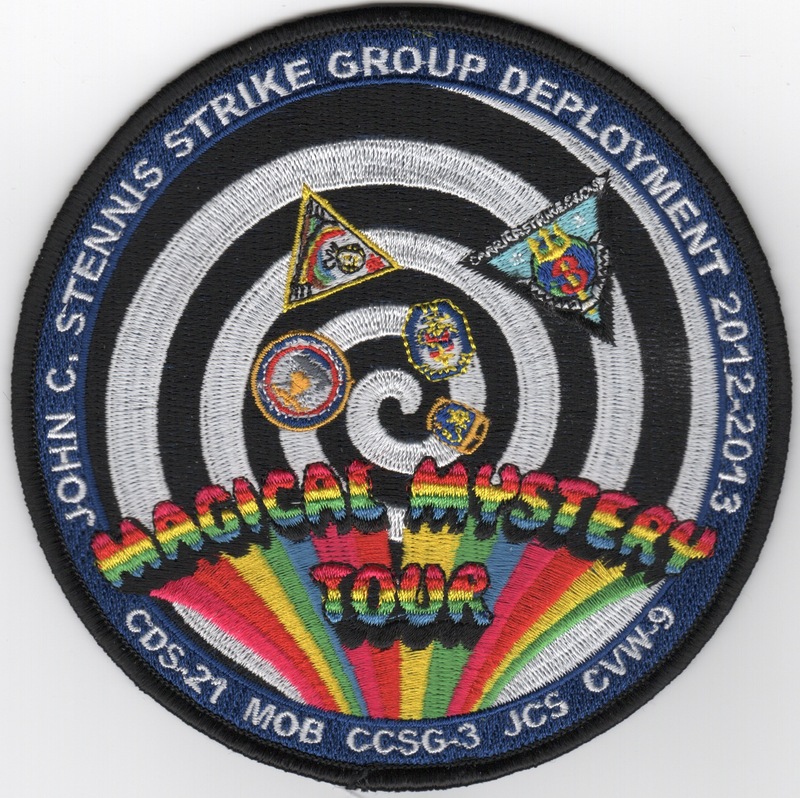 It's says "MAGICAL MYSTERY TOUR" in rainbow letters across the middle and "JOHN C. STENNIS STRIKE GROUP DEPLOYMENT 2012-2013" across the top, listing all the major commands in the Strike Group across the bottom. 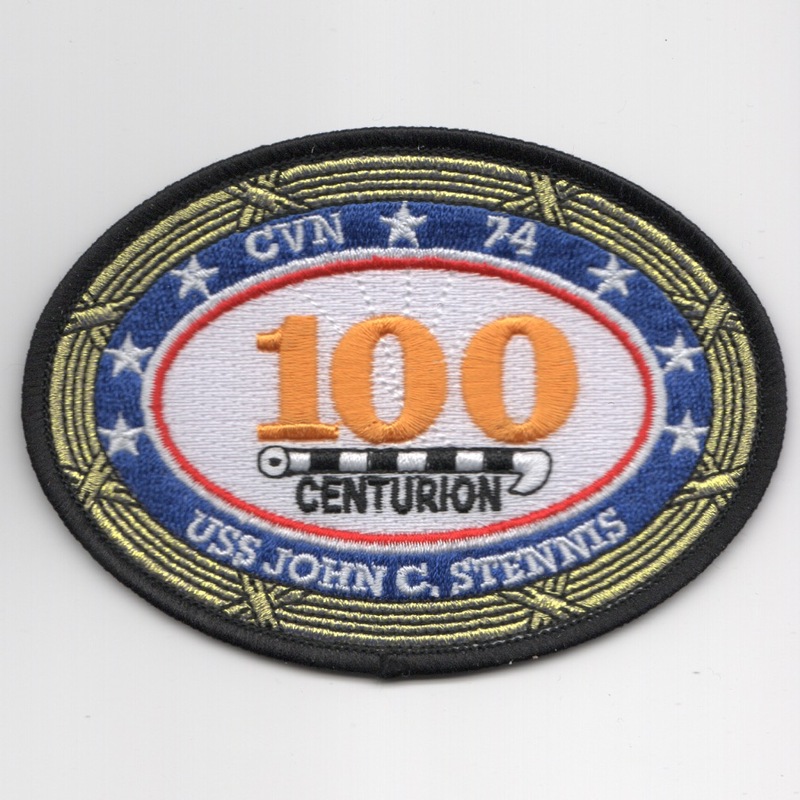 This is the '100-traps' patch for those pilots/Navigators that have landed on the John C. Stennis (CVN-74) 100 times or more. This patch does not come with velcro attached. 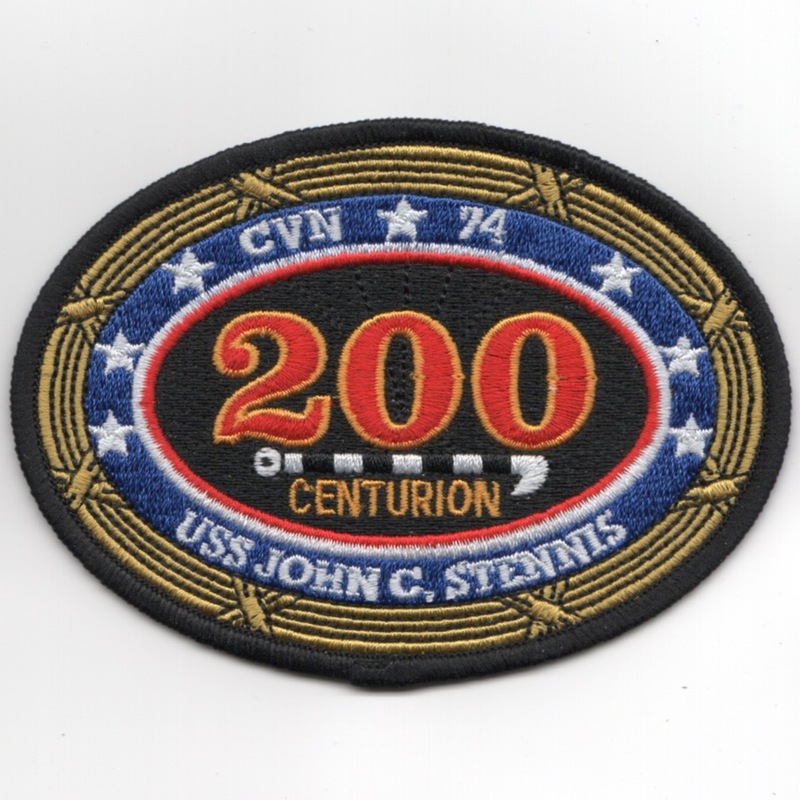 This is the '200-traps' patch for those pilots/Navigators that have landed on the John C. Stennis (CVN-74) 200 times or more. This patch does not come with velcro attached. 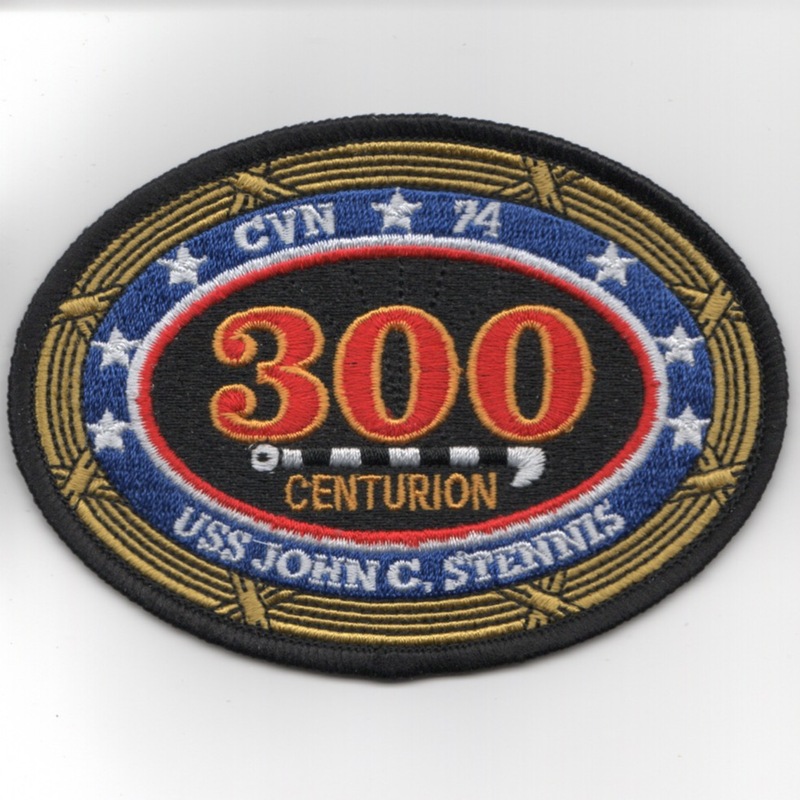 This is the '300-traps' patch for those pilots/Navigators that have landed on the John C. Stennis (CVN-74) 300 times or more. This patch does not come with velcro attached. 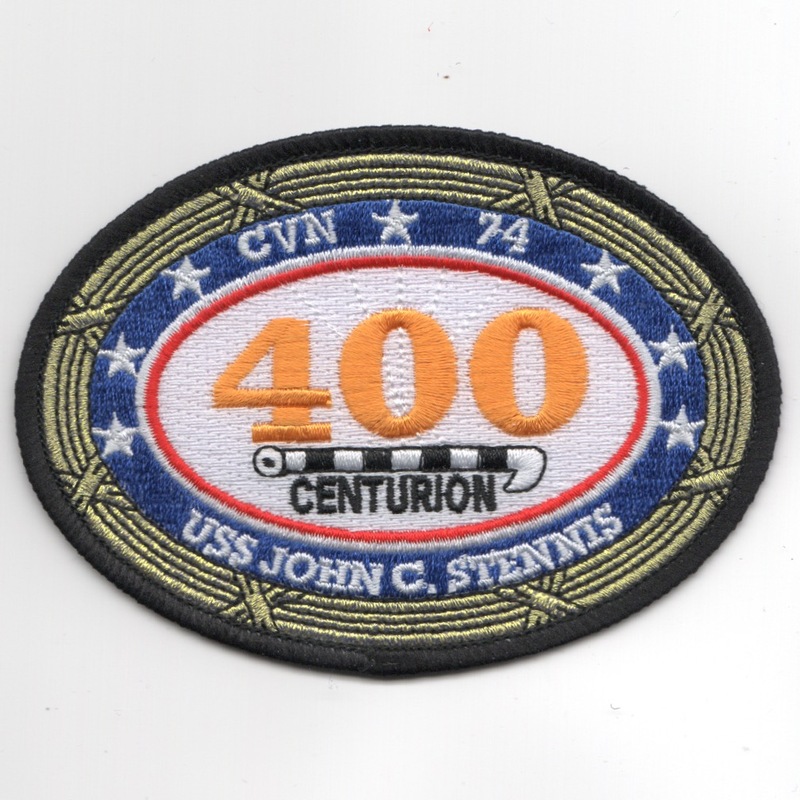 This is the '400-traps' patch for those pilots/Navigators that have landed on the John C. Stennis (CVN-74) 400 times or more. This patch does not come with velcro attached. 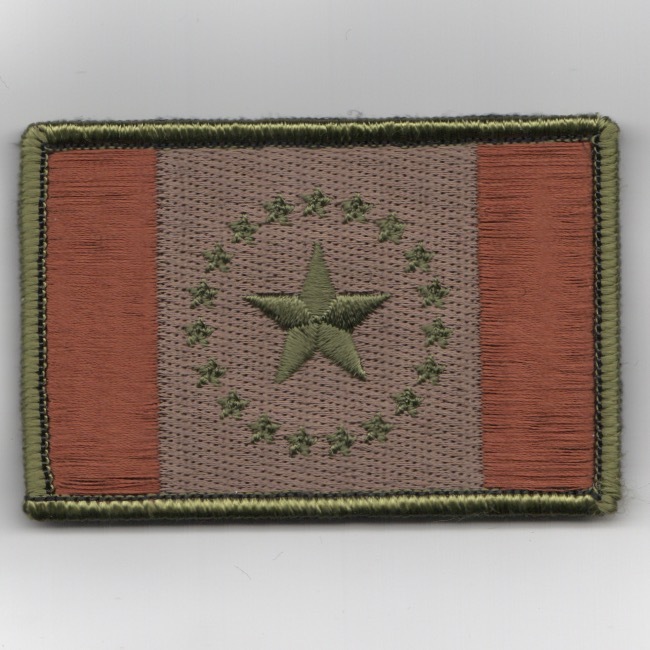 Use this link to get the set of FOUR "traps" patches shown above. 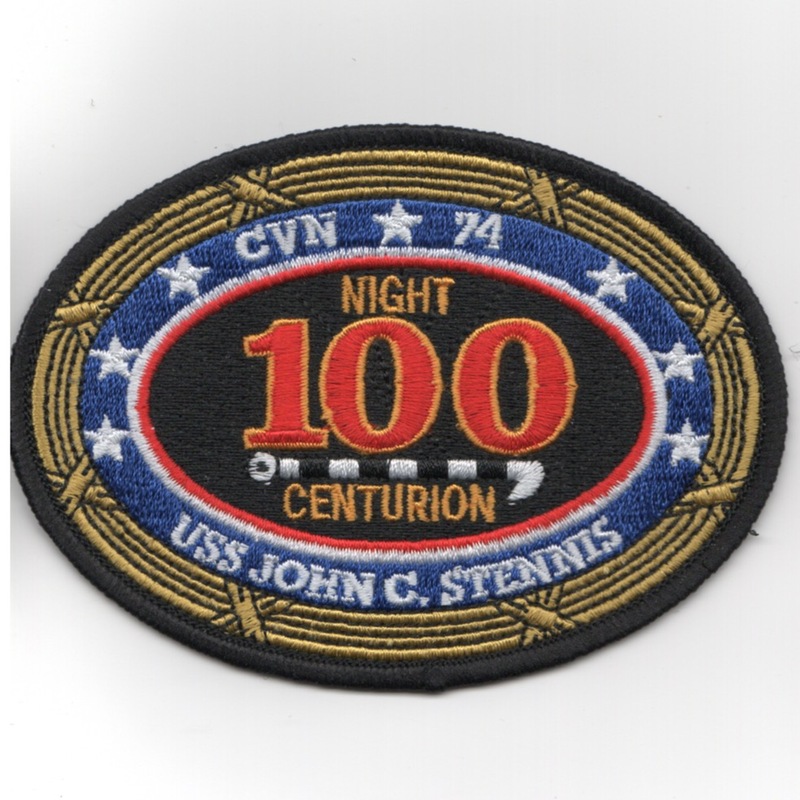 This is the '100-night traps' patch for those pilots/Navigators that have landed on her AT NIGHT 100 times or more. This patch does not have velcro attached. This is the '200-night traps' patch for those pilots/Navigators that have landed on her AT NIGHT 200 times or more. This patch does not have velcro attached. 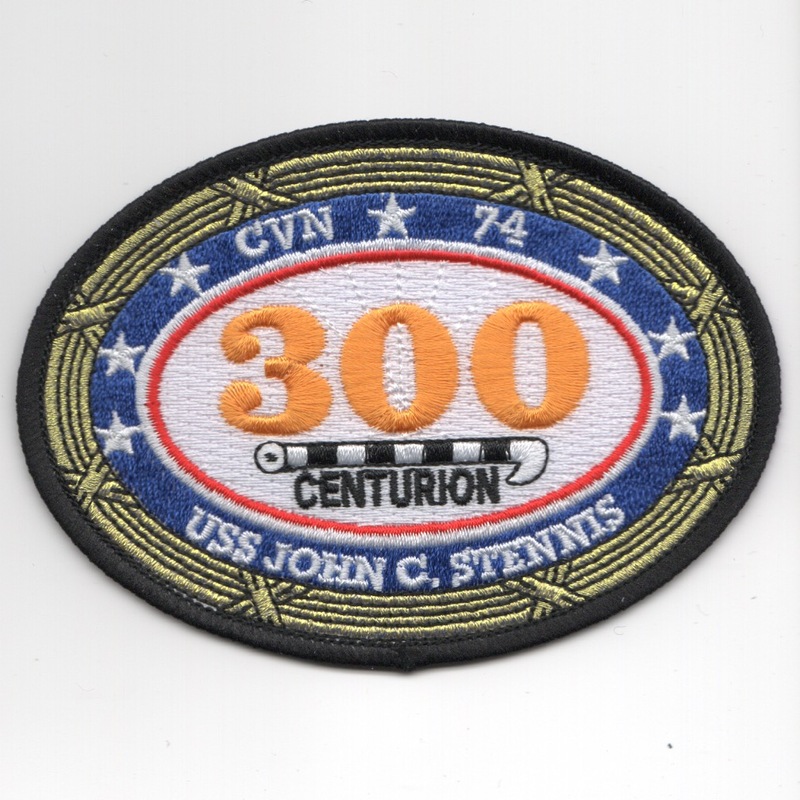 This is the '300-night traps' patch for those pilots/Navigators that have landed on her AT NIGHT 300 times or more. This patch does not have velcro attached. Use this link to get all three of the NIGHT TRAPS ovals at a discount. Designed by Laurin Stennis, a noted Mississippi artist and the granddaughter of the late Senator John C. Stennis, the Stennis flag pays homage to our state's past and embraces the future.� There are nineteen stars that form a circle around a larger center star, which represents Mississippi as the 20th state to join the Union in 1817. The centering of the blue star on the field of white is an inverted "Bonnie Blue," a reference to the state's secession (1861 - 1865). This is the color version of the flag and comes with velcro attached. Designed by Laurin Stennis, a noted Mississippi artist and the granddaughter of the late Senator John C. Stennis, the Stennis flag pays homage to our state's past and embraces the future.� There are nineteen stars that form a circle around a larger center star, which represents Mississippi as the 20th state to join the Union in 1817. 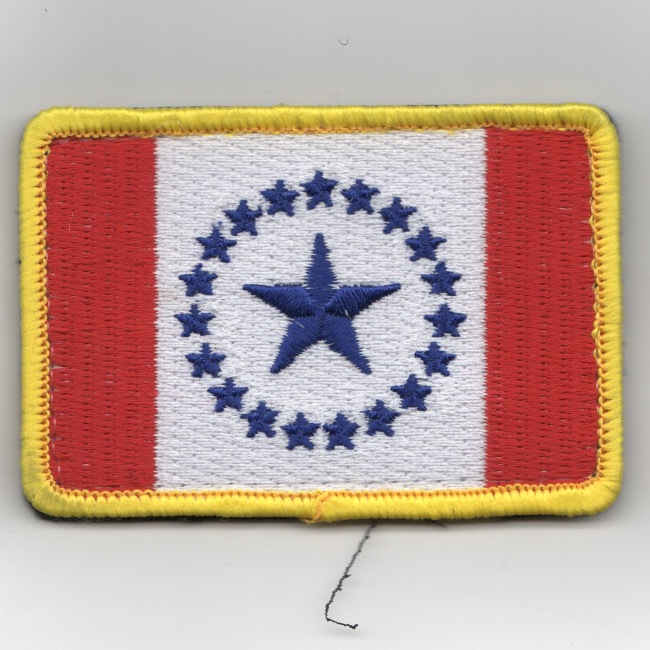 The centering of the blue star on the field of white is an inverted "Bonnie Blue," a reference to the state's secession (1861 - 1865). This is the subdued version of the flag and comes with velcro attached. 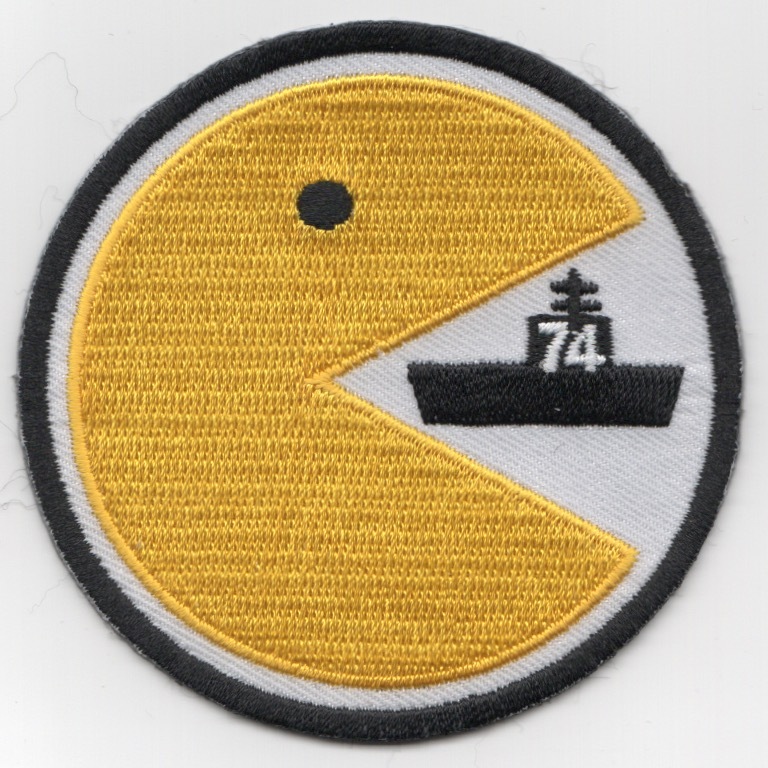 Homepage | Order CVN-74 Cruise Patches!